In Cambodia, about 10 million tons of rice straw is generated after harvesting and 3 million tons are burned. This practice is exacerbated by the increasing use of combine harvesters, which are machines used to ease the harvesting process and address the labor shortage in rice production. 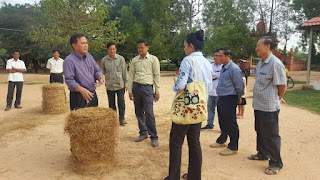 From 2016 to 2018, the BMZ- funded IRRI project “Scalable straw management options for improved livelihoods, sustainability, and low environmental footprint in rice-based production systems” facilitated cross-country learning of best rice straw management practices among Cambodia, Vietnam, and the Philippines. “Based on empirical evidences gathered through fieldwork combined with life cycle assessments, we came up with a decision-making framework that we hope each country will find useful for their straw management efforts. This is still work in progress that we hope that each country, like Cambodia, will find useful, and we are looking forward to feedback from our partners” said Martin Gummert, head of IRRI’s Mechanization and Postharvest Cluster. According to Meas Pyseth, “Through the project, we have learned important lessons from Vietnam and the Philippines, who are rapidly progressing in their sustainable rice straw management initiatives,” he said. “In Cambodia, we can see opportunities for mechanized straw collection and establishing business models from these, as well as enhancing the mushroom growing business for farmers,” he added. 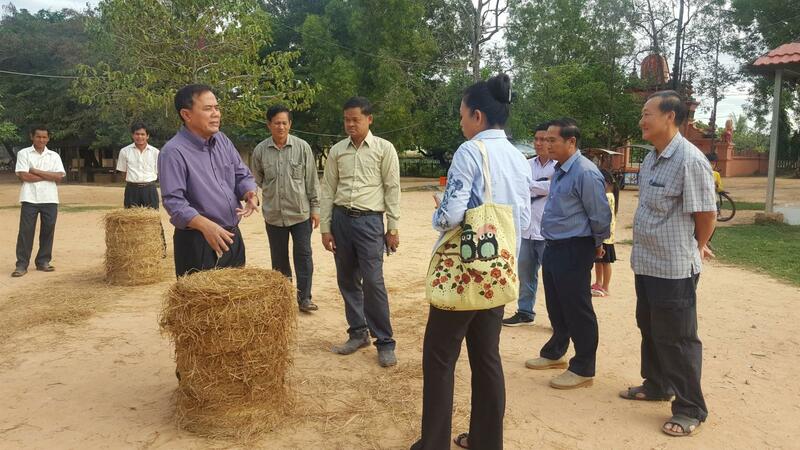 The 41 participants from livestock, machinery, various agricultural industries, and donor agencies joined a field tour at the Kampong Cham province where they attended a rice straw baling demonstration operated by Mr. Suth Se, a mushroom grower. He toured the participants in his mushroom growing facility where he applied the knowledge obtained from the training he attended in Can Tho University in 2017, through the BMZ project. “Attending that training enhanced my knowledge that I was able to apply in my facility, like the sterilization techniques for straw. I have now expanded to four mushroom growing sheds and can harvest 170 kg mushroom, with a total of USD 2,000 per month,” he said. To apply their learnings, the participants mapped out an outscaling framework in order to continue the initiatives in a wider scale. One of the recommended actions is to set up a working group that will set up strategic framework on implementing the rice straw initiatives as well as apply incentive schemes for the actors in the value chain. “We can also use workable extension mechanisms like technology demonstrations, farmer champions, and networking of key value chain actors to help us achieve our end goal which is to improve the smallholder farmers’ livelihoods,” A participant said. 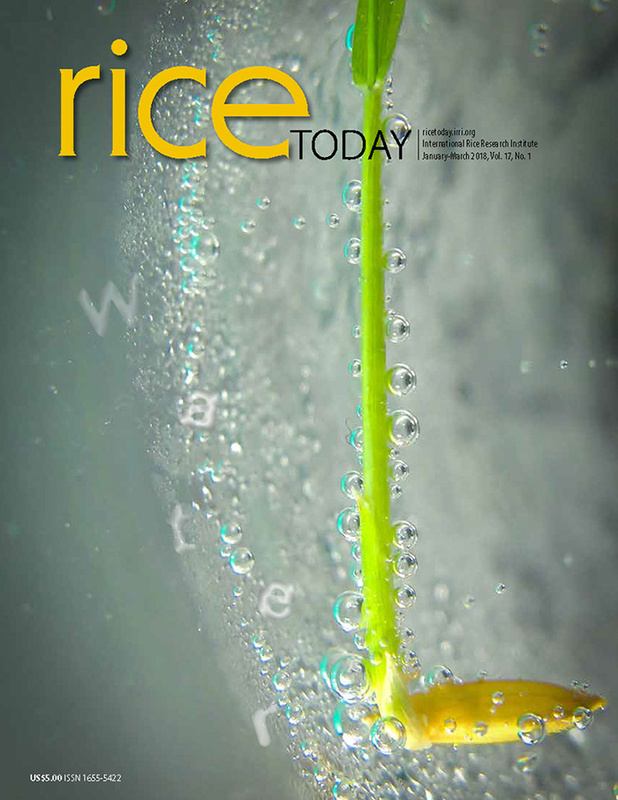 “To contribute to making rice production sustainable, increasing farmers’ income, maintaining and improving land quality as well as addressing the climate change concerns, the Cambodian Minister of Agriculture, Forestry and Fisheries decided to pay more attention to sustainable rice straw management. Specifically, rice straw management initiatives need to be included in the country’s agricultural development strategies and will be disseminated widely. Moreover, network of potential rice straw value chain actors needs to be established to create avenues where rice straw can help improve farmers’ livelihoods,” ” Dr. Pyseth said. The project outputs, which have been communicated through field demonstrations and training, contributed to this decision.